What is Saric’s Role this Season? Dario Saric has displayed moments of basketball brilliance at the Rio Olympics, but the role the San Hinkie’s Euro “star” will take on for our 76ers remains uncertain. There’s no doubt the Croatian national will see significant playing time for Brett Brown this coming season but it remains unclear if the rookie will appear in the first-five; or if he will be a valuable 6th man type; or simply a second unit player. It may also take some time to clarify which position Saric is best suited to play in the NBA, but that’s a topic for a different post. Despite all the question marks that surround Saric’s role during his debut season in a 76er uniform, one thing is certain, online NBA odds are forecasting that with Saric on the roster (and fellow rookie Ben Simmons) the 76ers will be a much better team in 2016-17. After the jump we’ll take an overview of Saric’s career and examine how the big man has done as a starter and a reserve with his previous teams. Saric has experience being part of a starting five and playing off the bench and that double-dip may benefit him greatly during his rookie season in the NBA. In the last two seasons with Anadolu Efes of Turkey, Saric spent the majority of his games as a key reserve. Saric received a respectable amount of playing time last season (22 mpg.) with Anadolu Efes and posted solid stats — 11.7 ppg. ; 40% shooting from three and 93% from the FT Line. As we all know, despite his reserve role in Turkey, Saric was widely considered one of the top prospects outside of the NBA. So the good news is that Saric has come off the bench previously and experienced some success. One could theorize that during his rookie season the Croatian big could easily slide into such a role for Brett Brown and the 76ers. Imagine a second unit that features Saric along with Sergio Rodriguez and Jahlil Okafor or Nerlens Noel. FILTHY. The question is whether or not Saric (and his dad) would be happy with such a situation. Now, let’s for a moment dream that Saric comes into training camp, simply blows the roof off Stockton University’s gym and leaves Brett Brown with no choice but to play him in the first-five on opening night. Well, good news. In the past Saric has had significant success playing as a member of a starting five. 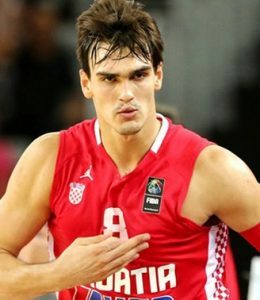 As a member of the Croatian Under-18 national team Saric was a starter, leading scorer (25.6 & 10 per game) and the recognized leader of a team that won the gold medal at the 2012 FIBA Europe Under-18 Championship. Saric’s first venture into “professional” basketball came with KK Cibona Zagreb in Croatia. In his second season with the club, Saric earned a starting spot and averaged 12 points and 8 boards per game. Saric helped push Cibona Zagreb to the 2012-13 Croatian National Championship, the 2013 Croatian National Cup and the 2014 Adriatic League title. During Adriatic League play Saric averaged 16.7 points, 9.7 rebounds and 3.2 dimes per game and was named the MVP of the Adriatic League, which is the top-tier professional basketball league for countries of the former Yugoslavia. Of course, we all watched the Olympic action last month in Rio where Saric (33 mpg) led the Croatian national team to a 5th place finish on the strength of 11.8 points and 6.7 boards per game. As you can see, Saric has a decorated resume as a starter. The idea of a 3-point shooting combo-forward like Saric and a dime-happy, versatile point-forward like Ben Simmons playing in the same starting five should make Philadunkia nation giddy. NBA teams typically struggle defensively when the opponent has one versatile forward on the court. Imagine the match-up nightmares the 2016-17 Sixers would create for opponents with Saric and Simmons in the starting lineup. It’s nearly enough to make me forget about the last three years of tanking. We should pump the breaks for a minute and acknowledge that Saric is headed into his rookie year in the NBA. If he simply serves a valued off-the-bench player this season, that would be a solid achievement for “the process” and a great building block for the future of this franchise. To be honest I would be completely satisfied with this result for Saric in 2016-17. However the reality is I’m greedy and when you review Saric’s storied basketball career and watch the highlights from Rio, I can’t help believe that “The Homie” is destined for bigger things during his rookie season in the Association.